When early humans, including our species, ate their own kind it was more likely for ritual purposes than for a nourishing meal, according to an unusual study released Thursday. 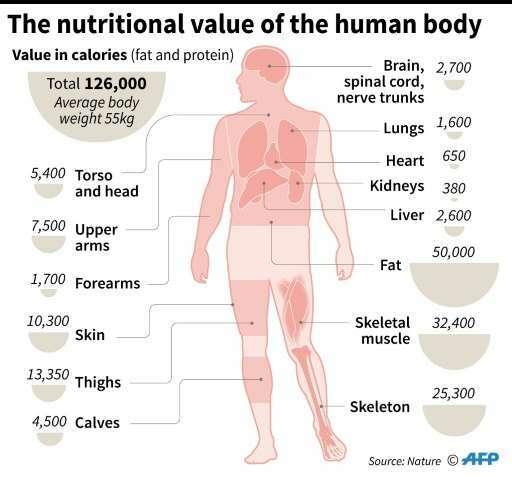 Carving up the human body to calculate the caloric value of each part, the study argues that prehistoric cannibalism—while less rare than widely assumed—was a dangerous undertaking offering relatively meagre nutritional rewards. Kilo for kilo, a wild horse, bear or boar had more than three times the calories in fat and protein than our lean-and-mean human ancestors, who were mostly skin, muscle and bone, according to the research, published in the journal Scientific Reports. Moreover, human prey—as wily as the hunter—would surely put up a good fight before being sliced up into filets. "I did the study because I wanted to know how nutritional we are compared to these other animals," explained James Cole, a senior lecturer in archaeology at the University of Brighton in England. "That might tell us whether we, and other human species, were doing it for the calories, or if there is some other explanation," he told AFP. The findings help flesh out the idea that cannibalism among homo sapiens—as well as Neanderthals, homo erectus and other hominins—was suffused with cultural meaning. Recent scholarship suggests our ancestors, including Neanderthals, had rich cultures, evidenced by artifacts, jewellery and perhaps language. "It seems unreasonable to think that early humans wouldn't have had as complex an attitude to cannibalism as we modern humans," Cole said. "They may have had as many reasons to consume each other as we do." "It's not just about the meat," he added. Sucking the marrow from a leg bone or gnawing on a spleen might have been a way to affirm territorial control and pay homage to deceased family members, Cole said. "The consumption of the food in that scenario is a kind of bonus," he pointed out. More broadly, the study suggests that our cave- or savannah-dwelling cousins were probably far more sophisticated than we suspect. A review of the fossil record, along with recent genetic research, shows that cannibalism among hominin species, or early man, was fairly common. "We don't have a lot of human remains," Cole said. "But even within that small sample, we still see quite a lot of evidence of human modification on those remains—butchery, cut marks on the bone—consistent with cannibalism." Bones with cut marks at the tendon joints to remove filets of muscle; long arm and leg bones that have been cracked to access the marrow; human teeth marks—all are telltale signs of humans feasting on humans. The earliest confirmed case of human cannibalism—found in a cave in Spain—features the species homo antecessor and dates back nearly one million years. Other research has shown that prehistoric humans developed some immunity to diseases, known as transmissible spongiform encephalopathies (TSE), that are spread by eating infected brain matter. "The only reason an evolutionary adaptation would develop is if you are over-exposed to the pathogens," Cole said. That could have arisen when a human ate, say, a lion that had consumed a bovine brain. The human variant of mad cow disease that erupted in the 1990s spread when people ate beef from cows that had been fed the brains of infected animals. "Or it comes from eating the brain matter of members of our own species," as is thought to have occurred with the Fore people of Papua New Guinea, who practiced cannibalism. A wide range of motivations are used to explain modern-day cannibalism, ranging from psychosis (think of the liver-and-fava-bean loving Hannibal Lecter), to warfare, medicine or funerary ritual. Shipwreck and plane crashes can also lead to survival cannibalism. But for early humans, Cole said, that complexity has been unjustifiably boiled down to "nutritional" versus "ritual", with the added presumption that food is usually the main motive. Ape meat is one of the last forms of bushmeat that indigenes are willing to give up. We have a taste for primate. Humans are immune to certain prion diseases, no doubt because of a diet of human brains. Tropical protohumans learned how to hunt the animals that had been keeping their numbers in check. The result was overpopulation. Competition over resources caused tribes to form, and tribal warfare became the principal driver of human development. There is little difference between hunting and fighting. The ambush is the preferred method of engagement in either case. And after a hard-fought victory who has the energy to chase gazelles? The next tribe over is always a little less human than yours. Animosity toward them in conjunction with cohesion and mutual trust within your own tribe, would tend to increase your chances of victory in conflict. And victory meant the slaughter of males and the incorporation of females. This form of group selection is what made us human. The tribal dynamic - internal amity in conjunction with with external emnity - is what drove the development of our species. Our brains were forced to grow as a direct result of competition among tribes. "To understand why our forerunners sometimes ate each other, she wrote in an email, "We still have a long way to go." -Understanding is simple. Whats difficult is acknowledging the central role of tribalism in human development, and all the uncomfortable implications of pseudospeciation. For instance, the notion that prejuduce is a natural behavior or that street gangs are a normal social phenomenon. Or that religion and nationalism are very rarified and potent forms of the tribal dynamic. Tribes are the result of competition, of the need to counter enemies. Can religions or nations exist without enemies? Or more importantly, does their need for enemies in order to exist make them extremely dangerous in their own right? I wonder if the cannibalism might have been a "natural" consequence of the ongoing overkill of other large animals? As those species were disappearing, ours was increasing in number. They needed something to eat when easy food was no longer so easy. Perhaps it was also viewed as a way to both assimilate the strength of the enemy tribe while also ensuring their elimination. A related point: People have an instinctual, perhaps genetic fear of the dark, even small children who have known only love their whole lives. We also have a perverse fascination with zombies. Just look at the movies and books. I imagine that when one tribe attacked another they made themselves out with face paint and other scary accoutrements. This burned a scar deep into our collective psyches that still exists. An added feature is that nighttime is also when most predators of other species hunt as well. Matzo Ball Soup with real balls? I disagree with the assumption that a large number of the eaten, were strangers. I think, when possible, DNA matches will show evidence that the eaters and the eaten were related. I do agree withe hypothesis, that funerary rites of the last few thousand years (i.e. Modern Period) arose from cannibalism as a symbolic means to connect with ones ancestors. Consuming your kinfolk to keep the magic in the family. I have always been of the opinion that it is stupid bigotry to call Humans, Homo Sapiens. That term is based on 19th century, nationalist bigotry that developed out of Predeterminism and Predestination & the pseudo-science of Eugenics. Instead, for accuracy and honesty in advertising. We should consider adopting as a description for Human Beings the term "Homo Anthropophagus". Everyone of us who exists today. Our ancestors did whatever was necessary to survive to reproduce. That "Desperate terror is the evil-stepmother of adaptive survival". "Historically, it has also been used as a practical expediency in especially desperate attritional or guerrilla warfare when the extreme hunger and the abundance of humans being killed coincide to create conditions ripe for cannibalism." Interesting article in wiki. Endo or exo - probably both depended on need and opportunity.